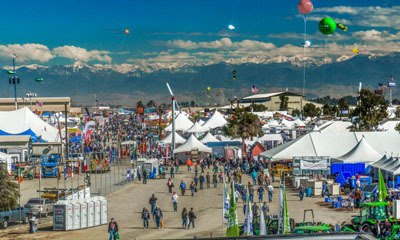 World Ag Expo will kick off its 52nd show on Tuesday, February 12, in Tulare, California. Gates will open at 9:00 a.m. The red carpet rolls out on Tuesday for Opening Ceremonies at 8:00 a.m. in the Heritage Complex Banquet Hall. The ceremonial opening will begin with an awards ceremony for Top-10 New Products Winners, sponsored by Bank of America, and "We Believe in Growing" scholarship winners, sponsored by E.M. Tharp. Past World Ag Expo Show Chairmen, VIPs and elected officials will hear from American Farm Bureau President Zippy Duvall and NASA Administrator Jim Bridenstine during the ceremony. World Ag Expo seminars kick off at 9:30 a.m. on Tuesday and run throughout the three day show at the Seminar Center on the South East end of the grounds. Sessions on Dairy, Water, Government Regulations and more can be found in classroom style buildings at the corner of U & South Street. Industrial Hemp sessions, livestock dog demonstrations, a Tuesday UC Davis interactive ag education session and a Wednesday drone demonstration will all be held in the new Demonstration Pavilion on Median Street, just East of U Street. A full list of seminars and special events is available online at http://bit.ly/WAE19Schedule. World Ag Expo and Toyota have partnered up again to offer the 2019 World Ag Expo Toyota Tundra Giveaway. The 2019 giveaway will benefit the Guilds of Valley Children's Healthcare. Tickets are $5 and will be available for purchase at World Ag Expo at Gate 2 and at the Toyota exhibit space. The drawing will be held on Thursday, February 14, at 3:00 p.m. in the Toyota exhibit space. Live webcams of World Ag Expo's show grounds, sponsored by KMPH Fox 26 and powered by HD Relay, can be viewed online at www.WorldAgExpo.org/live-webcams. Cameras offer views of activity on the grounds, including exhibitors, attendees and volunteers. World Ag Expo attendees can get the latest news, information and updates about the show by downloading the new 2019 mobile app. The free app provides mobile access to the schedule of events, an exhibitor directory, map of the show grounds and other visitor resources. The app is available for download by visiting your app store and searching for "2019 World Ag Expo." For a full schedule of events, more information about the show or to purchase tickets for 2019 World Ag Expo, visit www.WorldAgExpo.org.